Christopher Owens delves into the world of comic. "Alan Moore knows the score", according to Pop Will Eat Itself. And the evidence certainly backs up that claim. Consistently acclaimed as one of the finest writers in the English language (let alone the comic world), Moore's detached, surrealist and post-modern streaks have run rampant throughout Doctor Who Magazine, 2000AD, Batman, Swamp Thing, Miracleman, Jack the Ripper, Superman and even Alice and Dorothy (whose trips to Wonderland and Oz were ripe for Moore's perspective. His most acclaimed work, Watchmen, which examines what superheroes would be like if they lived in the real world, appeared in Time Magazine's "All-Time 100 Greatest Novels" list (the only comic book/graphic novel to do so) and remains massively influential not only in comics, but other mediums as well (that terrible Channel 4 series Utopia was clearly inspired by Moore's worldview). Hell, can you think of another comic writer interviewed on BBC Hard Talk? However, his best work had begun years beforehand. First published in 1982 (and subsequently republished in 1988), Moore and Dave Lloyd's celebrated battle of fascism vs. anarchism still holds strong in 2019, despite it being very much a product of it's time. Taking place over the course of a year (Nov 1997 - Nov 1998), the reader follows the exploits of V. Living in a Britain that has been taken over by Norsefire (a Christian fascist party) V himself had been interned in Larkhill "resettlement" camp and subjected to various experiments (as well as others who didn't fit the Aryan bloodline). Eventually destroying the camp, V becomes a masked anarchist, prepared to kill to get his way. 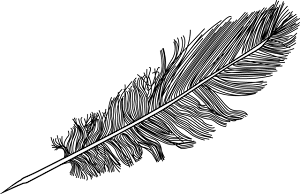 A simplistic summation, but one that is necessary as the myriad of various characters and their journeys throughout the tale are what form the backbone of the book. Through them, we view this dystopia through different angles: the orphan forced into prostitution, the widow disowned by the state, the stoic police who do what they're told to do, the ordinary person's apathy. With this mixture, it's easy to see how "resettlement" camps could be set up to wipe out parts of the population in the name of racial purity. 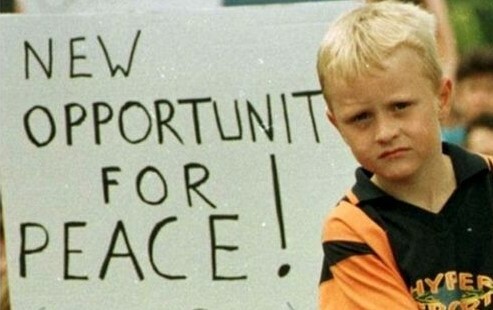 Make no mistake, this is a deeply affecting story. Like the main tale, the flashback scenes of the Norsefire soldiers marching through London and lifting anyone deemed "unfit" are told from differing perspectives: the child-like naivety of Evey, the experienced wariness of Valerie Page (whose segment on living openly as a lesbian before being taken away by the state remains one of the most stark and moving scenes in comic book history) and the stiff upper lip, "wehadtodowhatwehadtodo" voice of Eric Finch, leader of New Scotland Yard. 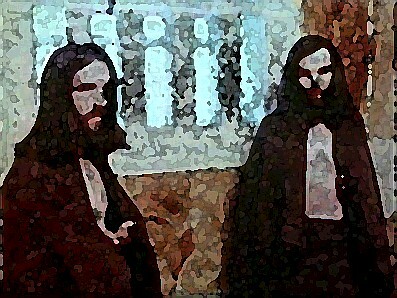 Combined, they give differing sides to the horror that was unfolding. But Moore never takes the easy route of having clear cut "heroes" and "villains." Indeed, V himself is an unlikeable character at times, while the leader of the party (Adam Susan) genuinely believes fascism is the way forward for his people, and cares about them. This tactic means that the reader is constantly questioning where their allegiances lie, even though what emerges before their eyes is an amoral, totalitarian race to the bottom. The grittiness of the times are reflected in Lloyd's artwork, which is the furthest thing from the slick artwork we see today in comics. Here, the colour grey dominates, and even lighter colours like yellow and pink are muted. The result of this is that you're forced to pay attention to the text, and the moments where the two combined hit the hardest are in the more solitary moments. Turned into a major Hollywood film in 2006, the message was watered down in favour of a War on Terror style take on the material. While laudable, it feels insipid compared to the original text, and the slickness of the end product instils no real sense of dread or anxiety. Maybe it was meant to be like The Catcher in the Rye, a classic best left alone. Who cares as, in the long run, the comic will stand tall. Alan Moore certainly does know the score. 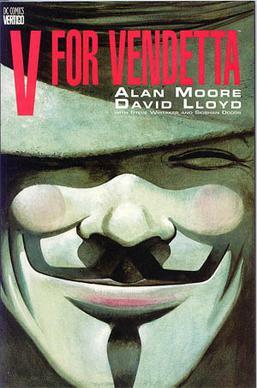 Alan Moore, David Lloyd, 1998, V For Vendetta. Comics. ISBN-13: 978-1401208417.